Facebook, Instagram, Twitter, Foursquare, Tumblr, Vine, Pinterest; isn’t the list of social media exhausting? Yet, it is such a prominent part of our society today, that’s probably why they call it social media. We are bombarded with chances to check our sites on our phones, computers, and tablets at all times of the day seeing content from friends, pages, and websites. It is no wonder that race makes an appearance on this stage. At the time I read this article, I laughed, and as I was reading an article about microaggressions this week, well, let’s say it all fell into place. I’ve gotten the “Where are you really from?” question more times than I can count and as a 5th generation Japanese American, sometimes I just want to scream, “I AM FROM HERE! THE US! JUST LIKE YOU!” Then they often ask if I speak Japanese, and well, I hate this question because I really wish I did, but my family has been here for over a hundred years and we immigrated to Hawaii. So long story short, I know just as many Hawaiian words as I do Japanese. 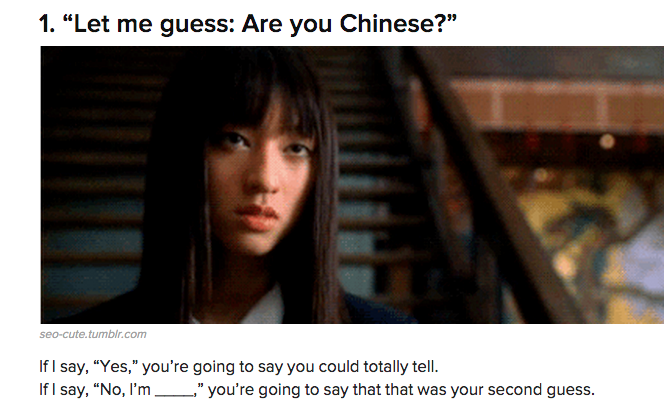 The point is, I’ve never went up to one of my friends that are not Asian and asked them these questions upon meeting them for the first time. It seems a little ridiculous. This BuzzFeed article is just the tip of the microaggression iceberg. It seems that these jabs that happen against people of all races and backgrounds are really a thing, and a serious one at that. Check out this article on microaggressions by Tori DeAngelis. The catch-22 aspect she is describing is something that is very real, often times these microaggressions are micro, people don’t know they are causing harm to another person, so even if confronted, nothing changes and no apology is made. In a round about way I am relating this all back to social media and in a little bit I will bring it back to education, since this was the place that I first saw the BuzzFeed article, but perhaps the vast majority of you reading this post can remember times when you have seen people acting out these microaggressions of race on social media. Pictures, memes (those pictures with words on them that are everywhere), and sometimes the words people post can qualify as microaggresions. In society, racial inequality is a struggle in our schools, in government, and in everyday life, but the struggle is also very present on social media and that is why it needs to be noticed. So many youth have social media and have been targeted through it or they may see these microaggressions and start to think of them as normal and acceptable. In this way, it can come back into our schools almost as a deadly virus. Check out this article on why some people are letting racial bullying slide on social media. I encourage you to read this article completely because it will open your eyes, but here is an excerpt to get you hooked. So the big questions. How do we fight this? And how can we bring this knowledge back to education? 1. Learn about microaggressions for yourself and be on the lookout for them. They’ll pop up on your social media, without a doubt. 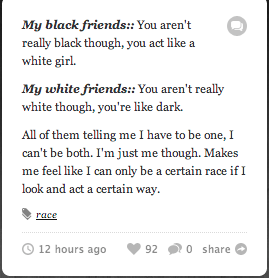 For real life examples, check out The Microaggressions Project and their tumblr. Check out their facebook here. Here’s this cool buzzfeed article about it too. And one more article for good measure. 2. Speak up! Use that block button, don’t let these microaggressions pass you by. Share these articles with your friends, family, co-workers. 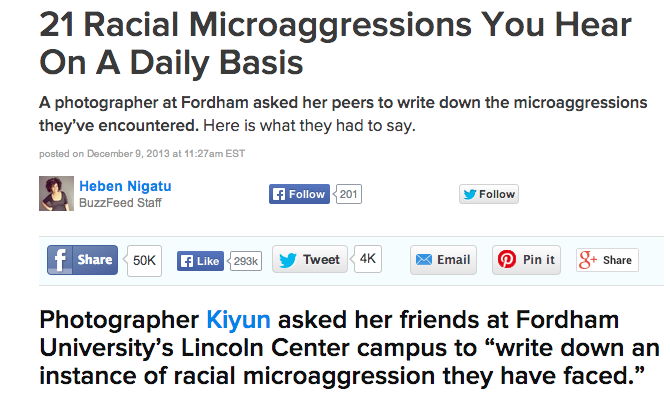 I didn’t know that getting asked “Where am I really from?” is called a microaggression. Learn and then tell others what you have learned. 3. Get involved. This is where the school aspect comes in. Cyberbullying and bullying in general is still a huge issue in our schools today. Not only bullying, but just providing education about cultures, ethnicities, privilege, and inclusion need to be prominent aspects of what we teach in our education system.That exerpt from the article about letting racial comments slide on social media talked about a girl who simply wasn’t educated about privilege and didn’t know what it meant. If we teach these lessons in our schools we can avoid these situations. Check out Stand for Children, an organization dedicated to having all children succeed, regardless of their background. I firmly believe that the first step to change is knowledge and have that knowledge spread across our schools, neighborhoods, cities, counties, the nation, and the world. We can’t afford to be passive about it or think that someone else is going to do it. You need to do it. One of my classmates, Angela Leal, sent an email to my PIC group about Swindells Child Disability Resource Center which offers free workshops to families, professionals, community members and students. I attended one last Saturday called Collaborative Problem Solving: Facing challenging situations with children and youth by Nicole Russell, LMSW. The three hour workshop gave me some great ideas on how to deal with explosive kids or meltdowns – something I’ve experienced a few times when working at a summer camp for kids with special needs. I was really impressed. 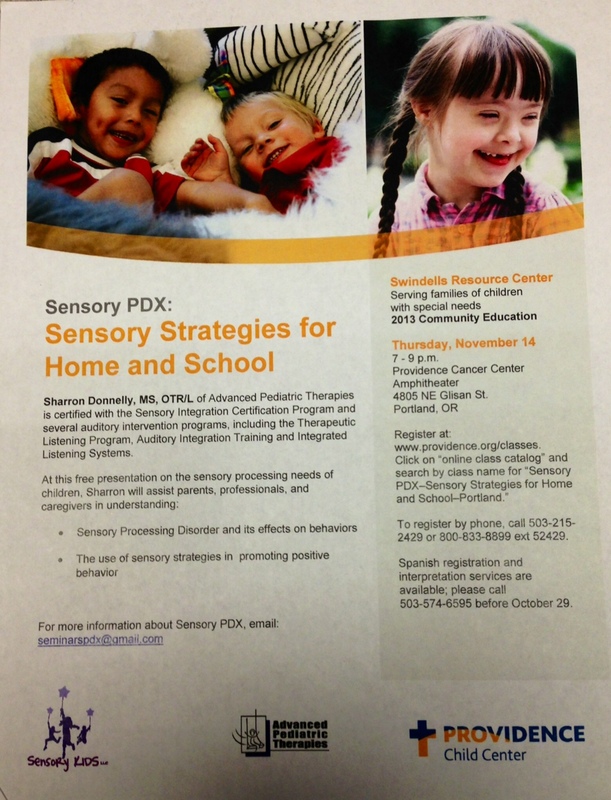 Swindells is offering a couple more free workshops to the public this month, one of which is this THURSDAY, NOVEMBER 14TH from 7-9pm. You can register for this event (and other great events) HERE. 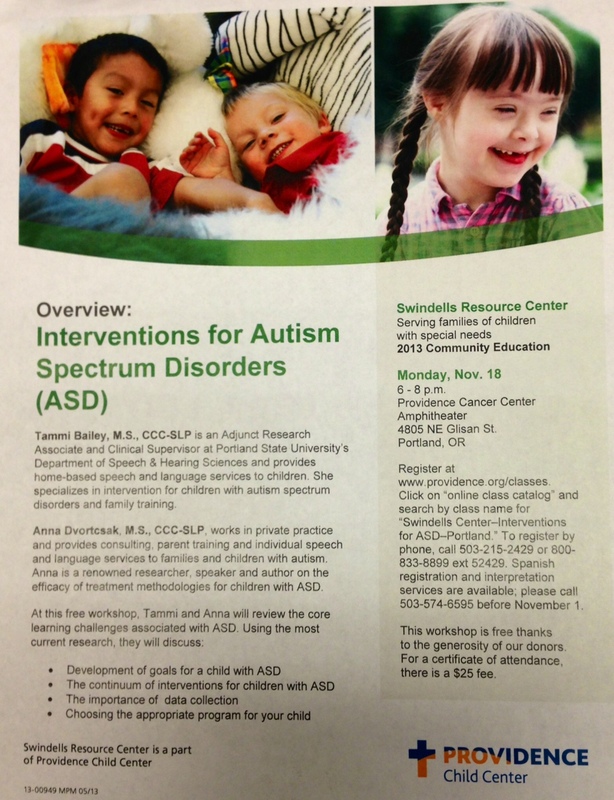 Interventions for Autism Spectrum Disorders (ASD) with Tammi Bailey, M.S., CCC-SLP and Anna Dvortcsak, M.S., CCC-SLP who will review core learning challenges associated with ASD, using most current research.